Molybdenum pins are used for manufacturing halogen automotive lamps, as sealed lead-wire through hard-glass. 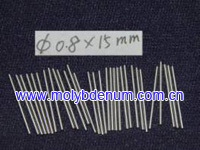 The molybdenum pins are doped molybdenum wires. The arc-height of a wire sample of 200mm length, located on a glass plate, can be not greater relative to the imaginary string than 20mm. The pins have a very smooth and bright surface and the surface free of stain, dirt, oxides, drawing tracks, scratches and damages. We are the main manufacturer and exporter of molybdenum pins in China and We have many years' experience in this field. We can make it according to customers' drawing, sample or sketch; Free samples of molybdenum pins are available for testing, welcome to contact us and hope to cooperate with your esteemed company!